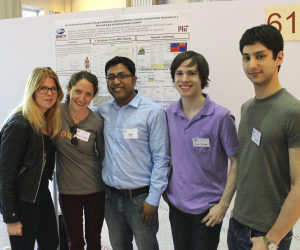 The PhysioMimetics Team was well represented at the recent MIT Center for Environmental Health Sciences (CEHS) annual poster session on May 13, 2015. Graduate Students, Postdoctoral Scholars, and Research staff presented the results of their research at MIT’s Morss Hall. Dr. Kelly W.L. Chen, who presented her work on “multivariate analysis of intestinal epithelial cell and immune cell crosstalk in normal and inflammatory conditions” took home first place in the postdoctoral scholar category. Congratulations, Kelly! Research Associate Dr. Ujjal Sarkar from the Bioanalytics team (Tannenbaum lab) presented his work on “An integrated assessment of drug metabolism, pharmacokinetics, toxicity and biomarker discovery in a liver and a gut microphysiological system.” Dr. Jiajie Yu, postdoc in the Translational Systems Pharmacology team, presented his work on “Systems pharmacology guided platform development and operation for the integrated Microphysiological Systems.” Well done, everyone! Ujjal (center) poses with Ellen Driever, Emily Suter, Jason Velazquez, and Collin Edington.